So, you looking to be the "one who knocks?" Cool. Now, we want to be perfectly clear. We're not suggesting you hop into a time machine to go back to 2007 and try to shoehorn Bryan Cranston out of landing his signature role as Walter White on Breaking Bad. Nope, that'd be no good! Because he did great. To much critical acclaim. And his work ultimately resulted in what is generally regarded as one of the greatest television shows of all time. No, a much more simple solution would just be dressing up as Bryan Cranston as his signature character, Walter White. And we have just the way to achieve that. 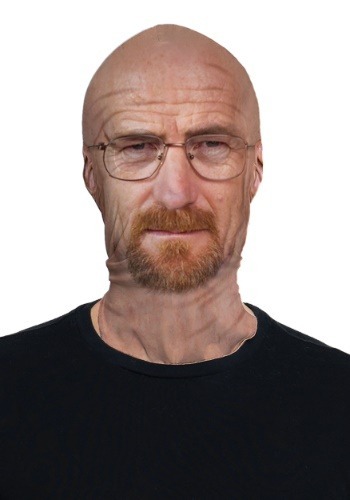 Just get this Adult Breaking Bad Walter White Fabric Mask! This mask is printed with photorealistic details, and it perfectly captures Walter's appearance from the show. Glasses, goatee, and bald head! It has see-through mesh sections in the eyes so you can see through the fabric, although this mask will partially obstruct your vision. Breaking Bad wrapped up with its season finale a few years ago, but it's still a top Halloween choice year after year! And we're sure that'll be the case for the foreseeable future. So, snag up this mask and shop our other Breaking Bad costumes, and we're sure you're going to be having a very "bad" Halloween!